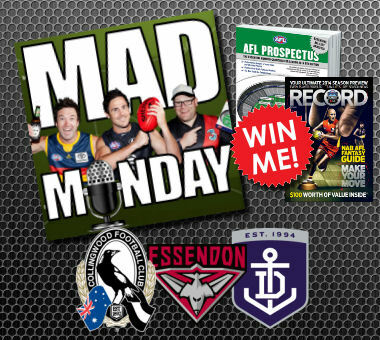 We look at Collingwood, Essendon and Fremantle today and announce a great competition for your chance to win a copy of the AFL Record and AFL Prospectus. 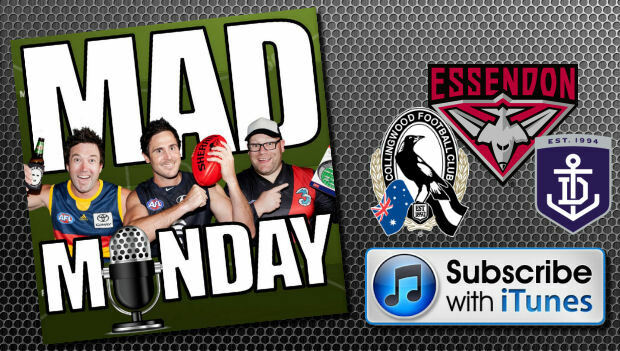 We’re back for our seventh pre-season Mad Monday podcast on the verge of the 2014 AFL Fantasy season opening for 2014! Subscribe now in iTunes and feel free to give us a rating and comment. Thanks for listening! We’ll take a couple of weeks off to enjoy the Xmas and New Years festivities. Feedback is always appreciated. Hit us up in the comments here and if you’re feeling nice, a review on the iTunes page would be great! As mentioned in the podcast, we have a giveaway this week! To win your own personally signed (this is optional) copy of the AFL Record which the boys have written for and the awesome AFL Prospectus, all you need to do is comment on this post below with an AFL Fantasy team name for a player of your choice. Be creative! Our favourite answer will win. Entries close 12pm AEDT on Sunday 9th February, 2014. Winner will be announced on the next podcast and contacted via email. I’ll be calling my team this year, as I am a glutton for (notso) clever wordplay.